Maria Daume was born in a Siberian prison. Now, she's making history in the Marine Corps. Maria Daume was born in a Siberian prison. Her mom died when she was 2 years old. A couple of years later, she was adopted and moved to the U.S.
And now, Daume is making history in the Marine Corps Infantry School. The course was made available to women a little over a year ago, and it's grueling. Daume is the first woman to graduate under the new integrated program. Three other women entered the Infantry school when Daume did. And before the program was fully integrated, a test group of around 200 women participated in the infantry school and graduated. Three of those marines joined the infantry after it was fully integrated by then-defense secretary Ash Carter. "We show that we can do the same thing as men can do; that there's no reason that anybody has the right to say you can't do it when I just showed you I can," Daume told Voice of America. Training included 12-mile hikes while carrying mortar systems, scaling nearly 5-foot walls in 30 seconds and moving 200-plus pounds while wearing a fully loaded fighting outfit. And Daume didn't just pass — she often excelled at the program. 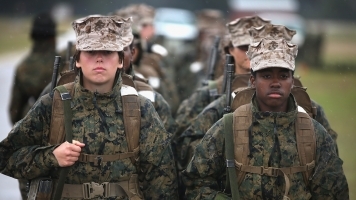 "She was right at the top of the pack," Marine Sgt. Matthew Schneider told Voice of America.